Is everybody feeling hot, hot, hot?! last night we had a surpirse activity planned by our tour guide along with 3 other intrepid tours. 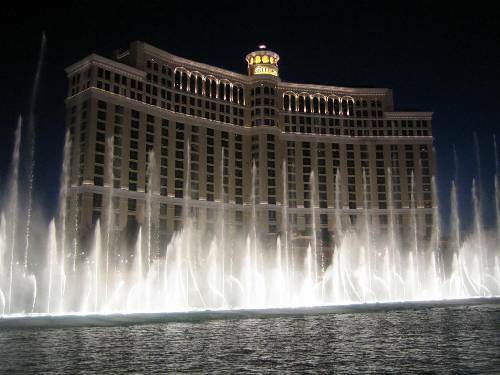 They had organized a huge hotel room on floor 28 of the mandelay bay hotel from which we could see down the whole strip and could party in. 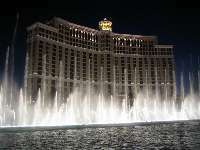 We then had party buses taking us down the strip and finishing with the last water show of the night at the bellagio. Pretty cool really. Yesterday we visited historic route 66 and the town that the movie Cars was based on. Funny little place really. The night before we had pizza overlooking the grand canyon at sunset. That was pretty cool. Especially as storms were rolling in all around us so it seemed that it was raining everywhere but on us. Our tour guide is a total airhead but she means well - we've had a few running jokes about her inability to follow directions or read signs which have a couple f times meant that we've ended up getting places really late. I'm very glad I got roomed with Sarah - she's a little younger than me but we get along well. So tomorrow we're off to death valley. In case we didn't think it was hot enough here, I expect it's going to get even hotter. It was awesome to spend an hour at the pool late this arvo although I'm a little concerned that I'm getting too fat to be legally allowed to wear a bikini. Dad you were in my dream the other night - I dreamt that you found a tiger in the backyard and while everyone was panicking, you went out and made friends with it like it was a dog.